or use a variety of styles for fun! 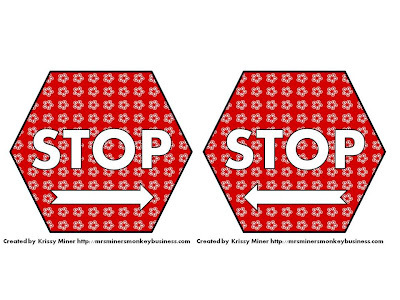 Head over to PreK and K Sharing to find out how on earth these stop signs could make your line walking, well, a walk in the park. Mesmerize all of your colleagues when your line of kinders is walking quietly, straight and keeping hands to themselves by the end of the FIRST WEEK of school by combining two tried and true techniques. I would also like to take this time to stress the importance of a visual daily schedule for your students. I began using one the year I had a group of children who thrived on schedules and knowing what comes next and I would never do without it, again. The students rely on the schedule to drive their day and, god forbid, if their teacher steals a teachable moment and veers from the schedule. Sometimes our day won't be going very well and I will all of sudden realize that we didn't go over the schedule or I didnt' change it from the previous day. It is amazing what an impact such a simple, management technique that literally takes seconds a day can have. I was so pleased to come across Tammy Lee's programmable schedule cards this summer. They are so cute AND I was able to put in the words I wanted to describe our daily events (we all know that we have our own fun ways to describe our days!). Tammy's schedule cards are going to make my schedule board look really good my students so happy so they can know exactly what our plan of action will be for the day. It's the best 6 bucks I spent all summer. I am sharing the bubble that I have hanging above my schedule board. When I am about to go over the schedule, I just point to the bubble and the students will read, "What are we going to do today?" (which just happens to include all words we learn during the year). I hope you find this freebie I am sharing very useful! Do you have your plans for the first day of school ready? If not, consider them done by purchasing my Back to School Lesson Plans for the 1st Day of Kindergarten. It has been a top seller all summer and will buy you time to do other things as you kick off your year. 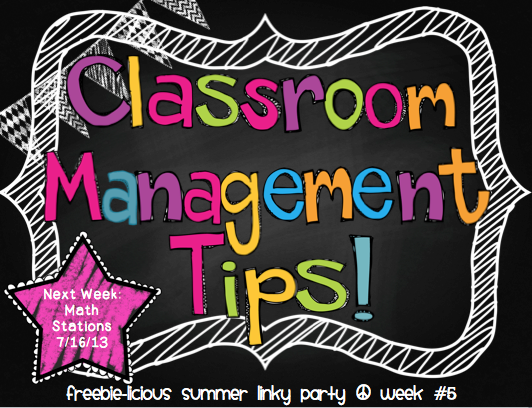 Click below for tons more management information via a Linky Party at Seusstastic Classroom Inspirations! How did I miss those schedule cards. In the cart they go as I frantically attempt to get my own classroom ready for the first day of school. Thanks for the freebie and for helping us keep ourselves (and our little ones) in line. I am just sitting here shaking my head thinking "GENIUS!!". I teach in what is now a Primary school (k-2). When I was in school here, it was 1st grade through 8th grade! Now that we do not have para-pros in K anymore, I need a way for my K friends to get to different places independently (or at least with an independent friend! )like the office, nurse, or cafeteria! This will really help out. I plan to put pictures with the signs to show them how to get to and from places. It will also help them to know where to stop so that the line can catch up. Thanks again, for keeping my class and my brain, and the other 17 Kindergarten classes in my school in line! Thank you so much! I agree with the poster above who said, "Genius!" I have carried a stop sign, but this is wonderful!!!! Online homework help,Assignment help by online certified tutors for students of high school,college and university in subjects like fiannce,marketing,programming,statistics etc. Hi there nice blog I love reading through your blog thanks for sharing such useful information regarding online assignments help. Keep continue to sharing information with us. Can never have too many classroom management ideas, thanks for the freebie!